In recent decades, the historiography of early modern Ireland in general, and of the seventeenth century in particular, has been revitalised. However, whilst much of this new work has focused either on the critical decades of the 1640s or the Williamite wars, the Restoration period still remains largely neglected. As such this volume provides an opportunity to explore the period between 1660 and 1688, and reassess some of the crucial events it witnessed. For whilst it may lack some of the high drama of the Civil War or the Glorious Revolution, this was a time that established a political and social settlement, based upon the maintenance of the massive land confiscations of the 1650s, that would underpin the social and class structure of Ireland until the end of the nineteenth century. Including contributions from both established and younger scholars, this collection provides a set of interlocking and interrelated essays that focus on the central concerns of the volume, whilst occasionally reaching beyond the chronological and thematic barriers of the period as required. 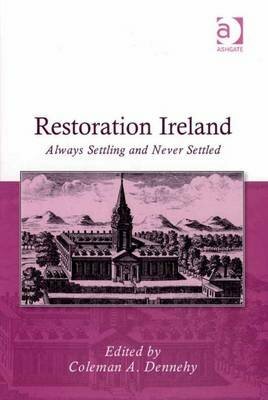 The result is a homogenous volume, that not only addresses a glaring historiographical gap in critical areas of the Restoration period; but also serves to take stock of the work that has been done on the period; and as a consequence of this it will help stimulate and provoke further argument, debate, and research into the history of Ireland during the Restoration period. Directed primarily at an academic audience, this collection will be useful to a range of scholars with an interest in seventeenth century political, social and religious history.